We are the leading manufacturer and exporter of Round Open Top & Easy Open End Tin Containers suitable for pure ghee, Essential oil and coconut oil. An ISO certified company, we try to fulfill client’s satisfaction and their expectations. Our emphasis on maintaining superior quality and international standards has given our products an edge in the market, meeting the fast changing demands and expectation of the customers. All types of potien powder tin containers . We are the leading organization in the industry to provide our clients the best quality array of Ghee Tin Container. Matching up with the ever increasing requirements of the customers, our company is engaged in providing Ghee Tin Container. We are considered as one of chief Printed oil Tin Container Manufacturers in the national and international markets. Our Printed oil Tin Container precisely designed to meet the requirements of the industry. 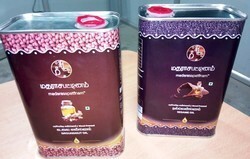 We provide Ghee Tin Containers at the most reasonable price in the industry. - Note: Minimum Capicity of 15 Kg. We are one of the leading manufacturers in rajasthan of tin containers. We make round tin containers ranging from 200gms to 5 liter. We have marked a remarkable position in the market by offering the best quality array of Oil Tin Container.